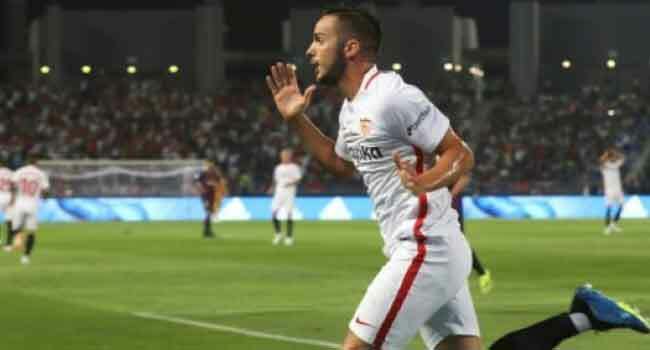 Five-time Europa League winners Sevilla look set for another assault on the competition after Pablo Sarabia’s solitary goal earned a 1-0 away win to Sigma Olomouc in the first leg of their playoff on Thursday. Celtic are also well-placed to make the group stages after a 1-1 draw away to Lithuanian side Suduva, but will be disappointed not to have made more of a host of missed chances. Celtic’s quest to put their Champions League elimination at the hands of AEK Athens behind them got off to the perfect start when Michael Johnston crossed for Olivier Ntcham to head home on three minutes. However, the joy of an away goal for Brendan Rodgers’s men was short-lived when goalkeeper Craig Gordon was caught flat-footed and allowed Ovidijus Verbickas to head home an equaliser 10 minutes later. Callum McGregor and Moussa Dembele passed up big chances to take a lead into the second leg next Thursday for the visitors, but Celtic were also grateful for two smart saves from Gordon after the break to make amends for his previous error. Champions League regulars in recent years APOEL Nicosia and Ludogorets Razgrad secured narrow 1-0 first leg leads over Kazak champions Astana and Torpedo Kutaisi of Georgia respectively.